Would You Paint a Commission? Watercolor & Casein, 22" x 30"
Recently a repeat patron asked if I would consider doing a commission. 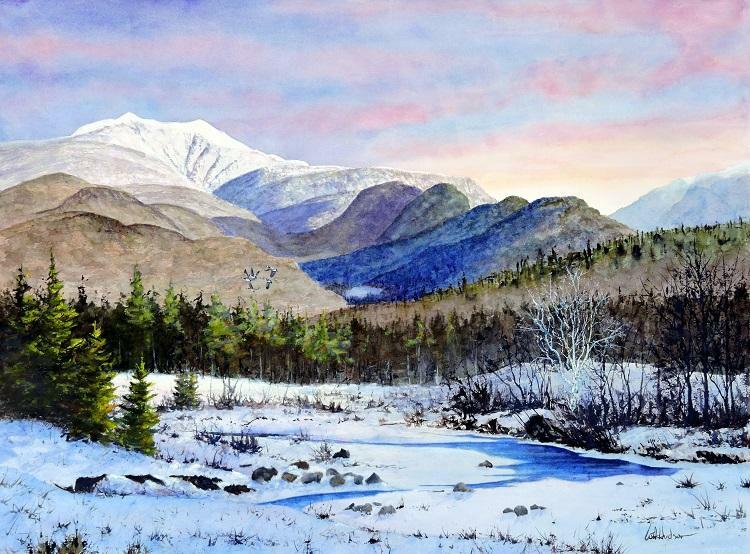 “Kristin” lives in New Hampshire with a backyard view of the White Mountains, particularly Mount Lafayette, a prominent peak of New England. 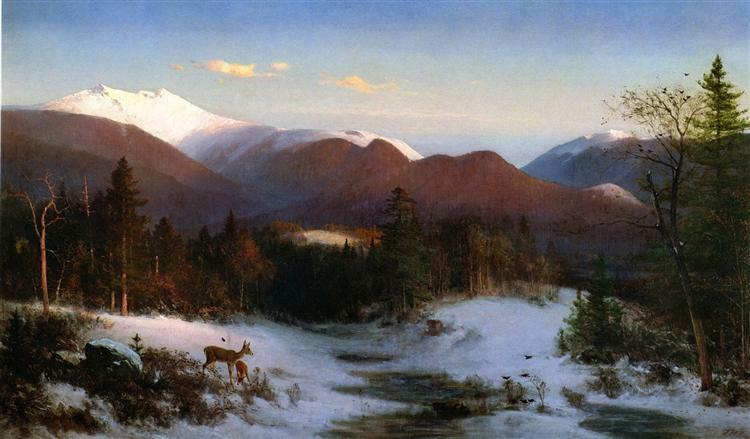 She provided this image painted by Thomas Hill in 1870 and requested something similar, but with compositional changes to be made from photographs that she would provide. She wanted a full-sheet image (22” x 30”) and was in no rush. I agreed and together we became a team. I made sketches, she forwarded photos, I submitted quick-study paintings, and she made comments and suggestions. I have long resisted commission work for many reasons. Most are obvious. They require more time, sometimes necessitate travel and research, and demand customer coordination which can restrict creative freedom. Often, I am simply disinterested in the topic and fortunately not dependent on art for income (I’m just an old retired aerospace engineer). But when I do accept a commission, I have always finished a better artist, a better person, because I put in that time, research, and coordination. The reward of having a happy customer is why we pursue art … to create something that others admire. A commissioned work is an investment to be owned by someone who originated the concept, became part of the creation, and values the effort far more than any passer-by. The epitome of a man reluctant to accept a commissioned work is Michelangelo. He insisted he was first a sculptor as he opposed painting the Sistine Chapel. He walked off the job, then returned …. and his masterpiece followed.